The L.A. Times Obituary is below and others can be read using the links at the right. Most obituaries originally appeared on June 27, 2005. Fred was buried at Arlington National Cemetery on September 30, 2005. 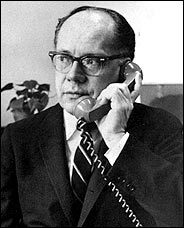 Fred Dutton, a Democratic power broker in both Washington and California who served as assistant to President John F. Kennedy and chief of staff for Gov. 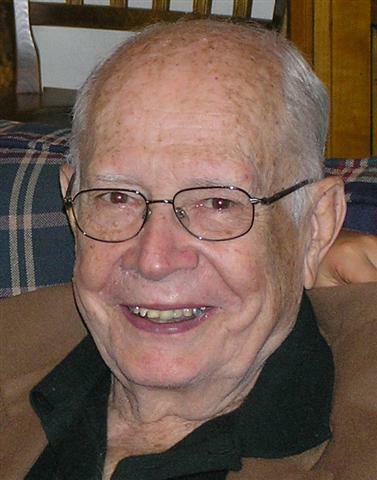 Edmund G. "Pat" Brown, has died. He was 82. Dutton died Saturday at George Washington University Hospital in the nation's capital of complications from a stroke. Known for his pixie-like demeanor and easy rapport with everybody, including politicians, members of the news media, business executives and student demonstrators, Dutton moved easily on the world stage. Since 1975 he had been Washington counsel and lobbyist for Saudi Arabia. 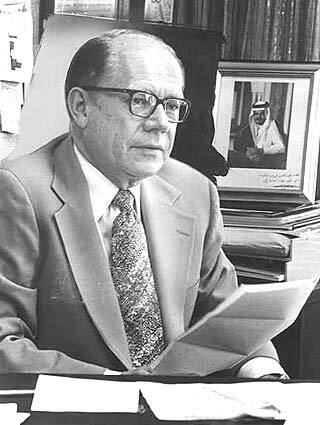 In that role he was generally credited for maneuvering through Congress the approval of major arms sales to the kingdom in 1978 and 1981. An influential intellectual who could impishly throw a gleeful "hee-hee-hee" into conversations or national interviews, Dutton wrote two books on national politics: "Changing Sources of Power: American Politics in the 1970s," published in 1971, and "Election Guide for 1972" in 1972. He also contributed frequent Op-Ed articles to The Times and other newspapers and was paired for some months with Ronald Reagan's campaign chief John Sears on PBS' "MacNeil/Lehrer NewsHour." 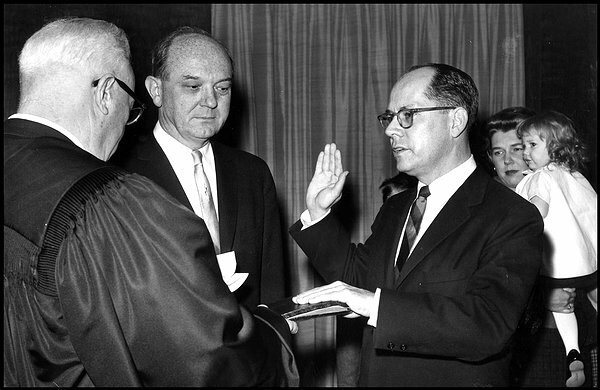 After campaigning for Kennedy, Dutton moved to Washington in 1961 as his assistant for interdepartmental and intergovernmental affairs and secretary of the Cabinet. He later transferred to the State Department as assistant secretary for congressional affairs. "The relationship of government to the chief executive, whether it is the president or a governor, is somewhat similar," he told The Times as he eased from state to national problem-solving more than four decades ago. But "the governor of California has more space — and it is more efficiently organized — than the president. I don't think anyone outside knows how small the White House office is." When Kennedy was slain, Dutton was tapped as coordinator of the John F. Kennedy Library, where he organized the Kennedy Oral History Project. Loyal to the Democratic party as well as the Kennedy family, Dutton took charge of the platform committee for the 1964 convention and wrote speeches for Lyndon B. Johnson's campaign. When Robert F. Kennedy ran for president in 1968, Dutton served as behind-the-scenes campaign manager. He was with the candidate when he was slain at Los Angeles' Ambassador Hotel, and rode with Kennedy and his wife, Ethel, in the ambulance to the hospital. Later, Dutton served as founding director of the Robert F. Kennedy Memorial Foundation. He also served on the Democratic National Committee's McGovern Commission from 1969 to 1972 to revamp the convention delegate selection process. His effort to include more women prompted feminist Betty Friedan to dub him "the Papa Bear of the women's liberation movement." Dutton also worked on the presidential campaigns of Hubert H. Humphrey in 1968 and George McGovern in 1972, but did so reluctantly. "After Bobby was shot, the lights went out for me," he told The Times in 1981. "I've never really been as involved in presidential politics again as I was then." The disillusionment helped explain to many why the unabashedly liberal Dutton, who established his Washington law firm in 1965, later agreed to represent the conservative Saudi Arabian government. He became so skillful at negotiating for and with the Saudi royals that one opposing Washington lobbyist dubbed him "Fred of Arabia," alluding to Britain's Lawrence of Arabia. Dutton's efforts to engineer the sale of defense equipment in 1981 even placed him on the same side as conservative President Reagan, little more than a decade after the two men had clashed when both sat on the UC Board of Regents. It was Dutton who coined the slogan "Reagan or Begin" — referring to then-Prime Minister Menachem Begin of Israel — to promote the sale of Airborne Warning and Control System (AWACS) planes to Saudi Arabia, a transaction that many American Jews saw as a slap at U.S. alliances with Israel. "I enjoy the intellectual vicariousness of it. They are obviously paying me very well," he told The Times in 1981, explaining his acceptance of the job requiring him to do such varied tasks as lobbying Congress to ship recliners to the Saudi king and defending Saudi students in auto accidents. "And I'm back in politics without it being at the personal level. I'm not back with Bob Kennedy in the hallway of the Ambassador Hotel. I like the fight…. I think international policy is important." Long before Dutton became a player in national and international politics, he had ensconced himself in California's halls of power. Born Frederick Gary Dutton on June 16, 1923, in Julesburg, Colo., Dutton moved to San Mateo, Calif., with his parents when he was 7. He served in the Army during World War II and became a prisoner of war after he was wounded in the Battle of the Bulge, earning a Purple Heart and a Bronze Star. After completing his bachelor's degree with honors at UC Berkeley, he earned a law degree at Stanford, where he was on the first editorial board of its law review, along with Warren M. Christopher, future secretary of State in the Clinton administration, and Shirley M. Hufstedler, who would serve as secretary of Education for President Carter. Dutton began his private law practice in San Mateo, and after serving in the judge advocate general's corps during the Korean War, became chief counsel for what was then the South Counties Gas Co. in Los Angeles. The energetic attorney cut his political teeth running the Southern California presidential campaign for Adlai Stevenson in 1956. That year he also linked up with Brown as the future governor's chief assistant in the state attorney general's office. As Brown's campaign manager in 1958, Dutton succeeded in bringing the first Democrat to the governor's chair in the 20th century. A grateful Brown made him chief of staff, where Dutton helped push the landmark California Water Project through the Legislature. The two men remained close even after Dutton left to join the Kennedy campaign in 1960, and Brown appointed him to the UC board, where he served from 1962 until resigning in 1976. As a regent, Dutton championed student protesters in the free-speech movement at Berkeley's People's Park and anti-Vietnam War demonstrations. Dutton clashed frequently with Reagan, who unlike other California governors took his automatic seat on the board seriously and attended meetings. Dutton and Reagan traded barbs over many issues, including Reagan's 1970 imposition of tuition, accusations that each politicized the board and Dutton's assertion that UC was a racist institution. Reagan was so provoked at one 1970 regents meeting in San Francisco that he shook his finger at Dutton and called him a liar. Dutton is survived by his wife and law partner, Nancy; their two children, Stacy Dutton of Philadelphia and Christina Dutton of Washington, D.C.; three children from his first marriage to June Kingborg, Christopher Dutton of San Anselmo, Calif., Lisa Dutton and Eve Dutton of San Carlos, Calif.; and seven grandchildren. Plans for funeral services and burial in Arlington National Cemetery are pending.